At last! After years of anticipation, Retro Festive is proud to offer the Griswold Advent House, as seen in National Lampoons Christmas Vacation! 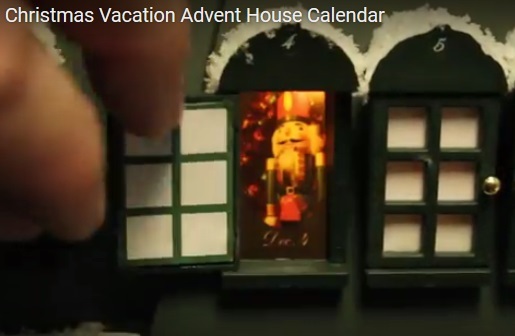 The Christmas Vacation Advent House Calendar is a detailed miniature version of the original Advent House Calendar that appeared in National Lampoon's Christmas Vacation. Now you can count down the days to Christmas Griswold style! Light the atrium and tower on December 1st, then open a new window to reveal a new Christmas scene each day, from December 2nd to Christmas Eve. so I got my advent calendar! It did not take long to arrive :) I was however, happy that I only paid the $260 for it because it's not worth the full price of $500. It's well made (plastic), detailed, and pretty sturdy, but for $500 I would expect more than a plastic house. So, if you're going to get it, definitely get it at the sale price. Oh and it looks really pretty at night when it's lit up. I also assumed, because I didn't read the description properly, that it would need to be plugged in, but it's battery operated (3X AA). I was a little apprehensive when ordering due to price & ltd. amount available but so happy with it. Very fine details & great illumination. I was expecting porcelain (product detail did not state what it was made of or how it was powered; battery) but happy with the heavy plastic. Lighter & less fragile. I am very happy with it & consider it a great value (less than $300.00 with tax). I have been wanting this advent calendar for years!! Finally decided to give in and get it because it's such a great price now (and I was driving my husband crazy!). Can't wait to get it! I'll update my review when I actually have it in my hands :) I'm just so excited I had to post something! !